My friend Ivy generously gifted me some cocoa powder when she visited us in Zagreb a few weeks ago. Since then, I’ve been adding a spoonful to my oats here and there just so I can use it up before we move to Belgrade. Chocolate for breakfast? Why not! Before this, I would add a few squares of dark chocolate to my oatmeal as a treat. Now I actually prefer the cocoa powder. A Tablespoon of unsweetened cocoa powder, while small in volume, adds a rich chocolate flavour to the oatmeal without loads of fat. The same amount of dark chocolate (approximately 3 squares) contains nearly 10 times the amount of fat and calories. Dark chocolate bars are also more expensive than cocoa powder and more fussy from a photographic point of view. I’m happy to have found a tasty alternative! Did you know dark chocolate is vegan? Check out my previous post to learn more. This recipe for chocolate oatmeal is the same as my banana cinnamon oatmeal with the addition of a Tablespoon of cocoa powder. I’ve tried cocoa and vanilla in oatmeal as well, but to me, cocoa and cinnamon work the best. The cinnamon brings out the chocolate flavour. 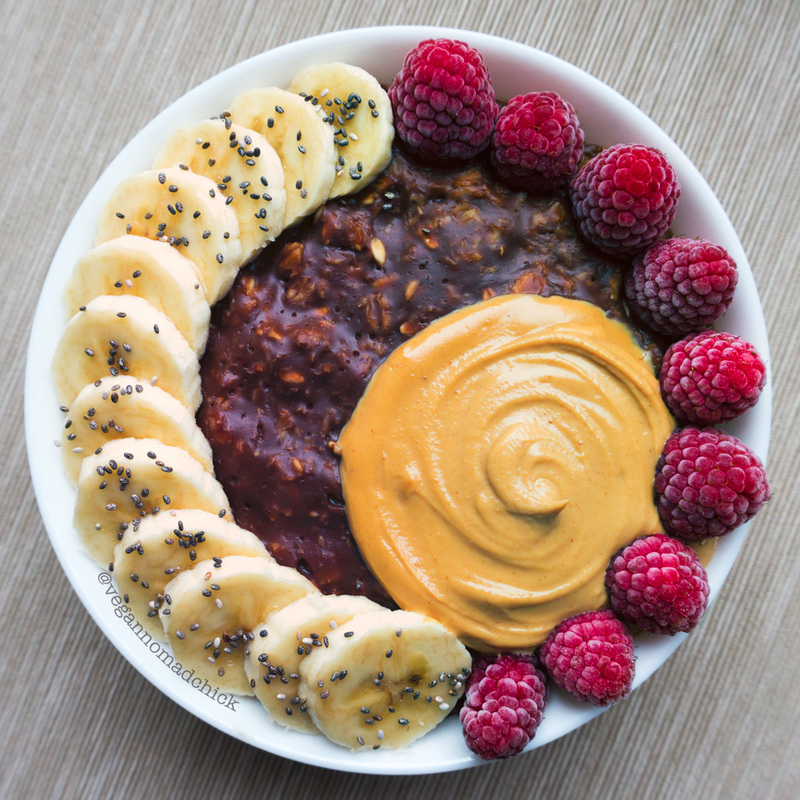 Chocolate oatmeal, PB2 peanut butter, and fruit make the perfect start to my day. This chocolate oatmeal satisfies my chocolate cravings without the refined sugar and excess fat that typically comes along with chocolate baked goods. If you’re not familiar with PB2 and would like to try some, order it from iHerb.com and use my discount code LIS5621. You’ll save 5% off your order! 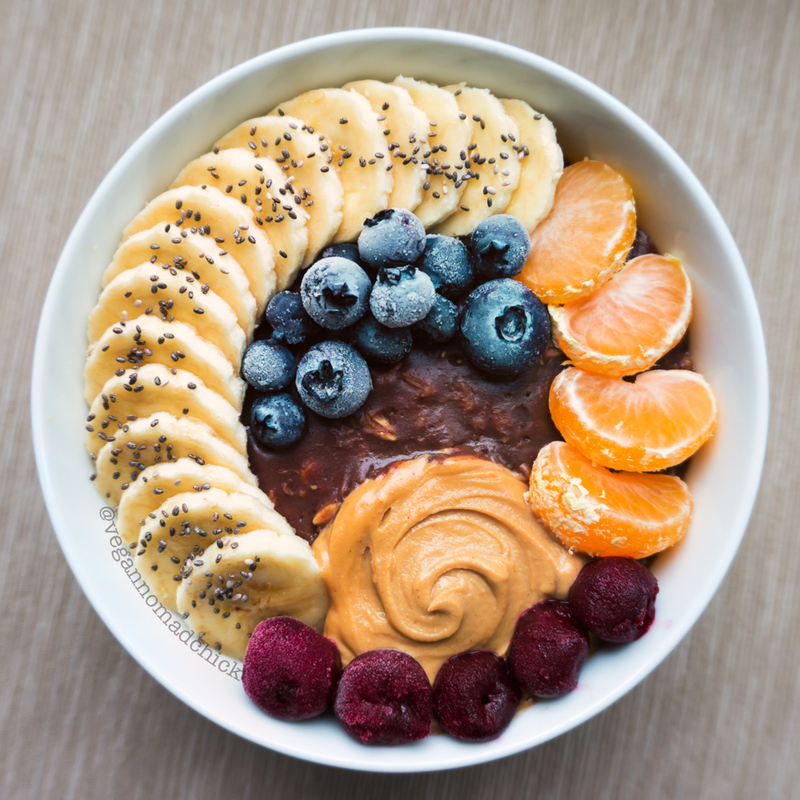 Not only is this breakfast nourishing, full of fibre, and oh so satisfying for those chocolate cravings, it's completely refined sugar-free and low in fat. Add everything to a saucepan and heat on medium-high heat. Mash banana slices into the oats as you stir occasionally. Once it starts to simmer, turn down the heat slightly and keep stirring until the oatmeal thickens. Continue cooking until the oatmeal is nice and thick. It should only take around 3-5 minutes once it starts to simmer. Turn off the heat and stir for 1-2 minutes so it thickens a bit more. 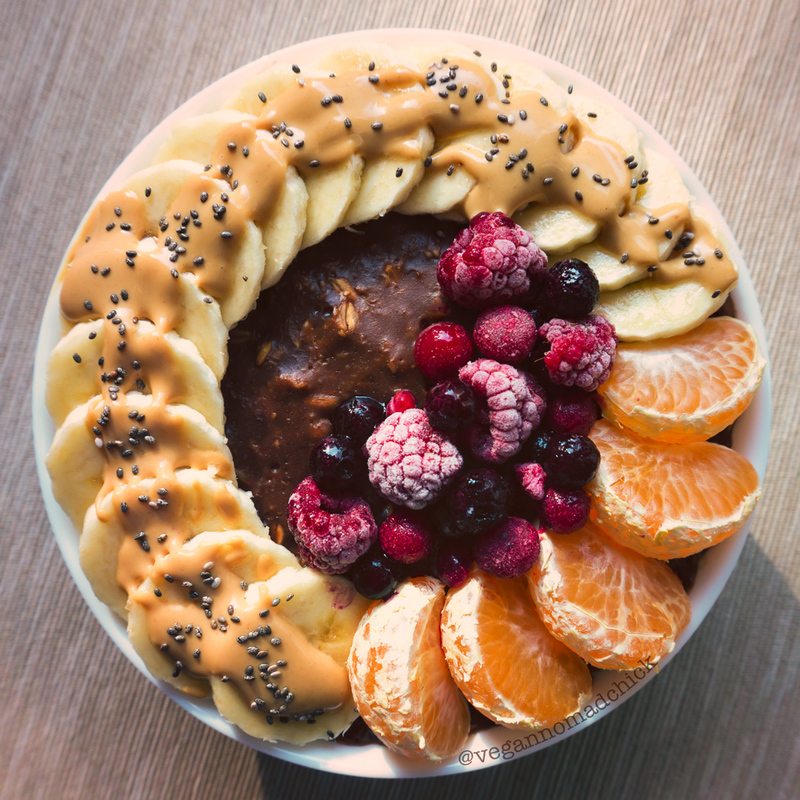 Remove from the heat, pour into a bowl, top with your favourite fruit and enjoy! One serving (the entire recipe) is approximately 375 calories without additional toppings. Bananas are sufficiently ripe when covered in brown spots. Using a ripe banana in this recipe is essential, otherwise, your oatmeal won't be as sweet!